Dental crowns are placed to cover your existing teeth for cosmetic purposes or to cover a tooth that is too damaged to sustain a filling. Once you have your crown it will function and look just like a natural tooth. Crowns can last for years with no problems, as well as you take care of them. But crowns can come loose if you aren't careful. Here are some tips to keep your crown where it belongs, on your damaged tooth. What Do I Do to Maintain My Crown? 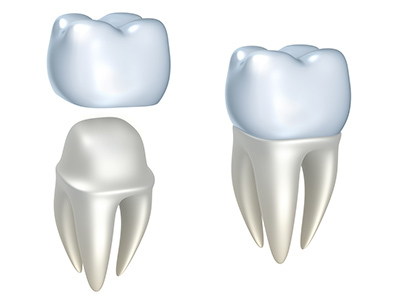 Crowns are cemented on to your existing tooth. The bond is strong and they will behave pretty much like a natural tooth. But still, though they are strong, they are not as durable as natural teeth. If you have a porcelain crown, try to avoid eating hard foods and don't chew ice. Regardless of the type of crown you should also avoid sticky foods. You should continue your normal routine of brushing twice a day. You should also continue flossing. If you don't want to floss or if it is hard for you to floss, you could try using and interdental cleaner. These are like little sticks that are specially formed to clean between your teeth. They are designed to remove the plaque that can accumulate between your teeth and cause cavities. You should be aware that your teeth can continue to deteriorate underneath your crown so it is very important to remove the plaque that lurks between your teeth. Another device you can use to prolong the life of your crown is a water flosser. A water flosser shoots a pulsating water stream at your teeth and helps dislodge food particles and plaque. Some flossers have an attachment that is a small, bristled brush that can brush around the base of your crown where bacteria hides.